Just after photo-eye moved from Austin to Santa Fe in 1991, Tim Whelan ventured in and quickly became a frequent visitor to our combined bookstore/gallery. It was clear from the get-go that here was a man truly in love with photography books. He'd stay for long periods of time, chatting with me about the books and photography in general, carefully making selections to carry home excitedly, almost as if he had unearthed significant treasure. After reading the recent New York Times Lens blog post on Tim, I was happy to hear that our bookstore helped motivate him to open his own photo bookstore in Maine, but was saddened with the announcement of its recent closing after 18 years of business. 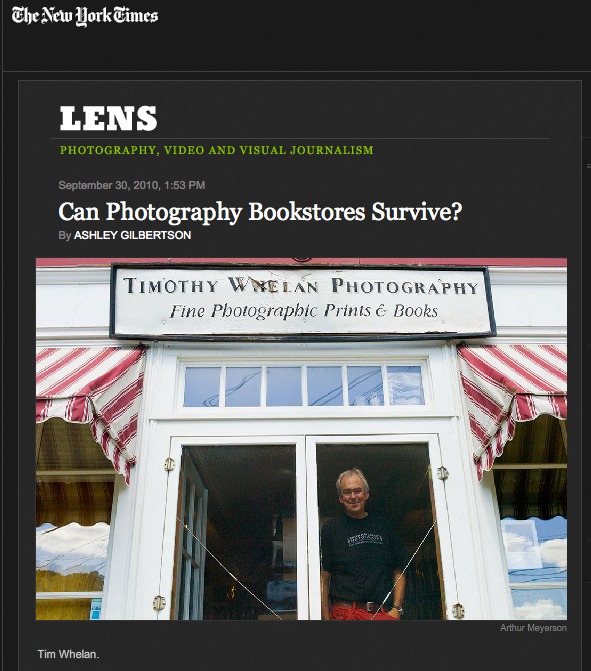 But since there was a question posed in the title of that blog piece, "Can Photography Bookstores Survive?" I thought (as a bookseller of 31 years running) I'd give my take more broadly on the future of bookselling in the digital age. It almost seems like a self-fulfilling prophecy, but traditional bookstores do appear to be going the way of the horse and buggy, perhaps sooner than any of us had ever imagined. Booksellers who desire to keep up with the technological advances may survive the sea change that is sweeping the industry. Critical to their success is the need to find different ways to sustain their first love: putting the worlds' knowledge, brilliant texts and illustrated art forms into the hands of appreciative audiences. It's clear to me that the paper illustrated book will indeed survive the onslaught of the digital, partially as a result of the evolution of smaller, more efficient and thus much more economical printing and binding techniques capable of smaller press runs, and partially due to the existence of that amazing marketing, sales tool and delivery service called the Internet. Social networks, including blogs, will be huge in getting the word out about new titles. Some of these books will indeed be viable commercial entities, with enough copies sold to targeted, sympathetic audiences to keep paper publishing alive and well. The better books will gain an underground reputation that will spread to those "in the know" and thus escalate in sales through word of blogs, Twitter and Facebook. Later these books will increase in value as objets d'arts. On the other hand, digital books will proliferate and may eventually overtake the number of paper books published. In fact, digital books may rule the universe of publishing at some point in the not too distant future, particularly as the traditional paper book reading population ages. The young, after all, were born in the digital age. But the richly tactile and multi-dimensional paper book will continue to be the collectible art form that it always has been, and perhaps even more so due to its more obscure nature. We at photo-eye, after moving to the Internet early on in 1996, do many different things to support ourselves and the art photography community that supports us. The Internet is where most of our business comes from day-in and day-out. If we had to rely on walk-in book sales, photo-eye would never have opened in Santa Fe. But here we are, alive and well, riding that amazing tidal wave of the digital revolution, excited about the potential of the photobook and its many new manifestations, now more than ever before. So here's to you Tim! Thank you for your years of great service to the photobook community! I personally wish you all the best in your future endeavors and hope that photography and the photobook continue to be part of your future. Read the New York Times Blog piece here. I'm so sad. I spent many hours there on the two visits I have made to Maine. Tim was a very personable and knowledgeable person and I loved pouring over all the fantastic photo books he had there. This saddens me greatly as i purchased a number of fantastic vintage photography books there on my visit in february 1999. Steve is a fantastic and extremely knowledgeable man. It is sad to see such a great thing come to an end.